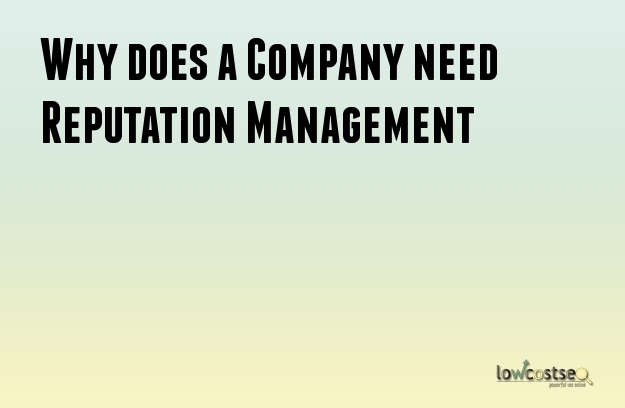 Why does a Company need Reputation Management? Is Reputation Management Important to your Business? Have you ever searched for reviews of a restaurant before deciding if you should patronize it? From acquaintances to new colleagues, many of us are often guilty of typing their names into a search engine to assess them. The Internet has become an integral part of our lives where our online activities are closely intertwined with reality. According to a study commissioned by Microsoft, 85% of the U.S. hiring managers surveyed base their hiring decisions on online reputation to some extent. As more people dive into the world of Internet, businesses see it as an opportune time to capture this market. However, in a bid to be ahead of the pack, businesses often risk their reputation with below par or negative content. So what does this entail for businesses with an online presence? A website is like a store front and your social media accounts are your sales team. From advertising to sharing tips on social sites, businesses are stepping up to engage and capture this growing audience. Flooding the internet with your company name or posts does not mean a higher search rank. Google’s algorithm is slowly eliminating pretentious websites to improve the overall quality of its search results. Imagine if you put in a wrong keyword for your website and acquire the wrong audience. Imagine if your adverts appear on abusive websites. Paid advertising requires you to target audiences and keywords, and this is often where the line between a successful and ineffective campaign is drawn. A complete and efficient SEO strategy should be targeted and precise. Competitors may resort to unscrupulous methods to smear your reputation online. These attacks will leave a trail of negative content about your company, and often in a subtle way. SEO Reputation Management helps by pushing down these negative search results by posting positive content of various types. Just like how a bad rumor can tarnish your image, a negative review of your business can cause your sales figure to plummet. It is imperative to constantly monitor the online community to identify and address such negative reviews which are often without any basis. Always ensure that your posted content addresses the need of your audience as opposed to solely chalking up points for SEO. As your website is consistently refreshed with updated content, you will not want users to read outdated information when they search for the company. This is where a professional SEO company can step in to ensure that users are always greeted with the latest information. Word-of-mouth advertising is such a powerful marketing tool. A positive comment has the ability that turns numerous heads. Many companies often undermine the importance of Reputation Management and fail to understand how it can damage their brand image. Are damaging content getting ranked above your official content in search engine results? A well-constructed SEO campaign can protect your company by making it hard for negative content to surface to the top of the search results. Is your company protected today? Prevention is better than cure. The growth of a company does not occur in a single day. It occurs over the course of years. However, the growth of the company can be indefinitely halted if new customers are no longer contacting the business. The company may still have the old and existing customers coming back for business. However, that will not be enough. New customers need to be attracted to the company. Your company might not be attracting new customers simply because of the negative reviews that have been placed online. The comments made by people online about your company can be the most important factor that contributes to the image presented to your potential customers. Your prospective customers may determine the quality, the skills and the reliability of your company based on the reviews you have garnered online alone. The type of business that you run does not matter. Recent studies indicate that the overwhelming majority of people place more trust on the reviews they view online from perfect strangers. These people will use those reviews to influence their decisions regarding purchases and companies. It is now more important than ever to ensure that your company has a stellar 5-star reputation online. The fact is the internet has become the perfect spot for both marketers and customers to meet. Nowadays, every company tries to ensure that all marketing efforts get directed online. You can print brochures, flyers, invest in SEO and social media networks but ultimately your customers will go online to find out more about you. If the online reviews are bad, your customers will form a negative perception of your company and refuse to conduct any business transaction with you. Customers want access to information that can make them feel safe and secure into entering a business deal with your company. They want to ensure that the purchase decision they wish to undertake is the most reasonable and the safest option available. Currently, that confidence can only be got by reading the reviews posted online by other customers. You need to take up an active role into developing and protecting the online reputation of your company. This role entails five points of action. You simply cannot hope that a few positive reviews in a few review websites can improve the reputation of your company. Instead, you need to approach the issue widely. Ensure that your company gets positive reviews on at least a few major review websites. Avoid taking a shortcut by posting fake positive reviews about your company. It is highly unethical and when you are caught, your company will suffer. The penalties levied by review websites can be quite harsh. Recent reviews are given more importance by search engines. Ensure that your company gets favorable reviews every time you deliver a satisfactory product or project to your customer.